Domino’s Pizza Enterprises Ltd is one of the most digital-savvy companies that exist today. Over the past 5 years they have created and sustained incredible growth. Their digital innovations are extensive - from engaging customers with personal and relevant messages across a variety of digital channels, through to using technology such as their GPS driver tracker to provide incredible levels of convenience while lowering operating costs. They have gone beyond their customers immediate understanding of what is possible to expect from a pizza experience and are using an understanding of their customers lives, empowered teams, and technology to create the future of quick service restaurants. By becoming the first to successfully shift the majority of customers from traditional phone ordering onto online channels, they were able to initially supercharge their business - simplifying operations and freeing up cash to invest in new innovation. For Dominos though, simply digitising their existing business model was not enough. Domino’s was hungry to accelerate its ability to continuously disrupt their competition. They partnered with ThoughtWorks to engineer their business as a digital enterprise, which means having the ability to rapidly respond and adapt to changes, experiment with ideas, and scale innovations across their franchisees and markets. Embracing new ways of working, Dominos was able to use Agile and Lean principles to bring marketing and IT together. ThoughtWorks depth of experience supported improved prioritisation, idea validation, and executional speed across core initiatives. With impressive year on year financial growth, the 2015 financial results reveal that the tech driven initiatives from emoji-based ordering to GPS order tracking helped Domino’s post a record interim profit of $43.3 million, up 50% on last year. e-infrastructure to Domino’s Europe and Asia, Domino’s required a new technology platform. To keep up with these impressive numbers they partnered with ThoughtWorks to create a new cross-channel api-driven HTML5 ordering platform. Delivering the gains needed today while preparing them for the continuous disruption in the mobile and social ecosystem. Targeting pizza lovers to use dominos.com.au as their preferred destination for buying pizza, the site was launched only six months after the project’s inception in July 2013. For Domino’s customers this was the biggest change since the first platform launch in 2006. While simplifying the pizza ordering process for customers, new experiential features such as ‘Pizza Chef’ led to deeper customer engagement, increased basket size and loyalty. Our determination to be the market leader for digital innovation has already seen us achieve over 50 percent of sales online and, over the next three years, we want to grow this to 80 percent. Immediately after the launch Domino’s witnessed a dramatic increase in site visits and conversion rate. Revenue from online orders has doubled, and basket sizes have increased. Maintenance costs were significantly lower and marketing could implement campaigns without being constrained by technology. Following the success in Australia and New Zealand the platform was then rolled out to remaining international markets. Beyond a great ordering site, Domino’s together with ThoughtWorks built a platform that helped them set the foundation for their digital innovation. It provides Domino’s with flexibility to experiment, make changes, and pivot based on emerging tech or changing customer demands. Create a pizza, promote it across social networks or by any other creative means, and earn a piece of the profit for every pizza sold. That’s the premise behind Domino’s award-winning Pizza Mogul platform. In just 11 months, the Pizza Mogul initiative resulted in 63,000 users, 130,000 pizza creations and more than 10,000 pieces of user generated content. The idea behind Pizza Mogul goes back to 2012, when Domino’s launched an experiential iPad app called Pizza Chef, which allowed users to visually drag and drop toppings to create their ultimate pizza designs. Seeing a significant increase in basket size for orders made through Pizza Chef, Domino’s wanted to push the idea further. Partnering with ThoughtWorks from idea to execution Pizza Mogul was launched in July 2014, with less than five months of customer experimentation, prototyping and development. 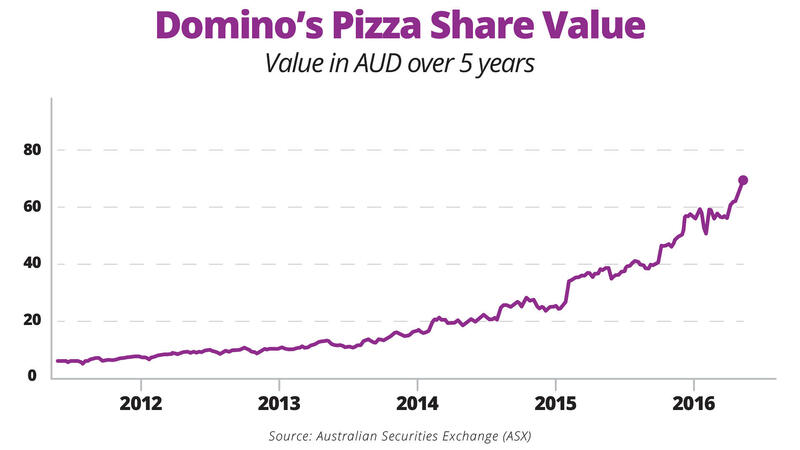 Pizza Mogul, along with the $4.95 price promotion and a record number of newly opened stores, helped Domino’s post a $29.1 million net profit in the six months leading to December 31st 2014, up 44.2% from the first half of the year. Don Meij, Domino’s Group CEO and MD, described Pizza Mogul as a strong sales driver for the company; the 22% growth in orders in the December half were attributed to the social commerce innovation. Click here to read the full Pizza Mogul story. Have you ever wondered whether a customer that walked up to the counter and pulled out a coupon was getting a better deal than you were? Yeah, us too. So to play on this customer feeling ThoughtWorks helped Domino’s deliver an Offers app to make sure that Value Seekers could always feel able to hunt for the best deal. With the Offers app, location awareness, and the franchisees ‘Campaign Manager’, stores can now time and send relevant notifications to entice those nearby and at home to grab a tasty pizza. To improve the customer ordering experience, ThoughtWorks helped Domino’s deliver a refreshed responsive site, which creates a visually enhanced ordering experience with a focus on food imagery, improved functionality and a refined design. The new responsive site was delivered on time, and was rolled over to the Netherlands, Belgium and France markets. To slice the time it takes to place an order, ThoughtWorks mapped the user journey and designed a new flow, which reduced the ordering time from minutes to seconds. With the rise of wearable technology, Domino’s made quick ordering available on both Android and Apple watch. Immediately after the launch of 4 click ordering, Domino’s recorded hundreds of orders in the first hour of store trading. Simply impressed! First time that I have ordered Domino's and I've got to say that the online ordering was so easy and quick, it was actually entertaining!!! Just when you thought it couldn’t get any easier, Domino’s launched SMS ordering. Taking convenience one step further, Australian pizza lovers can get their favourite order in just a few seconds by texting the word ‘pizza’ or the pizza emoji to Domino’s SMS Ordering number. technology-enabled convenience is at the very heart of the Company’s digital strategy. 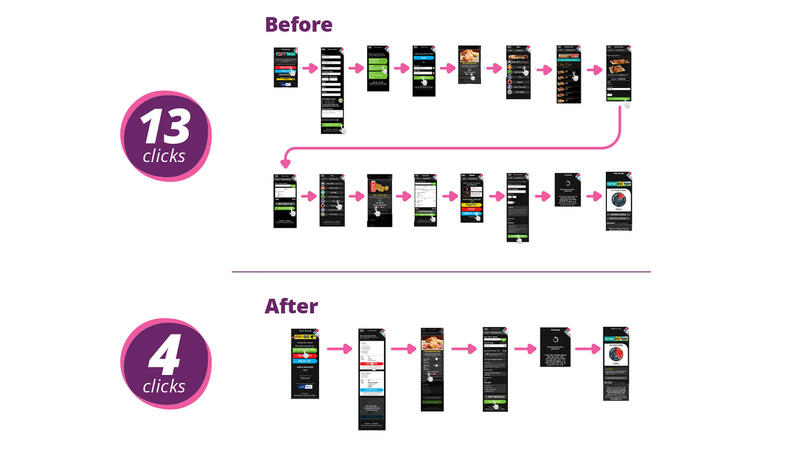 SMS ordering was an obvious development – shifting from traditional customer engagement to more progressive platforms. STAY TUNED FOR THE NEXT TECH DRIVEN INNOVATION FROM THOUGHTWORKS AND DOMINO’S! Learn more about how ThoughtWorks is helping retailers challenge the status quo.